West San Jose, as the name states, is the farthest west point of the City of San Jose. The boundaries are not tightly defined but include parts of San Jose adjacent to Campbell and Cupertino in particular. West San Jose: the location is the thing! Developed mostly in the 50s, much of this area is close to the foothills with plenty of shopping. 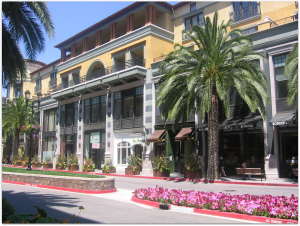 Home to the Westgate Center, Santana Row, and nearby Westfield Valley Fair there’s shopping for everyone, and plenty of restaurants and nightlife. The historic Century Dome theatres are a landmark (sadly soon to be torn down! ), as is their neighbor, the famous Winchester Mystery House. For a break from the urban, West San Jose has a number of neighborhood parks and is only a few minutes’ drive from the Fremont Older Open Space Preserve and the Saratoga Country Club. A Silicon Valley community, and with Santa Clara Valley Medical Center just outside this neighborhood, work isn’t far away. Access to a number of freeways and expressways makes commute easy. West San Jose is served by a number of distinguished schools on the east side and the affluent Cupertino Union and Fremont Union school districts serving the western side. As with all of Santa Clara County, there are several school districts serving this district, San Jose’s westside. Homes with Cupertino Schools will sell for a very high premium. (Even the 95129 zip code has 2 different school districts.) If you see pricing that doesn’t seem to make sense, it’s probably due to different schools. This is one of the more confusing aspects of Silicon Valley real estate. Below please find a live Altos Research chart, showing the median list price of homes for sale – this will give you an idea of what a house might cost there. How’s the real estate market in San Jose Western Side? Find out using my ReReport, market analysis updated monthly.